A King’s College chorister battling a terminal disease defied doctor’s orders to stay in hospital so he could sing at the choir’s world-famous carol service. Musical prodigy Alex Stobbs, 20, suffers from a virulent form of cystic fibrosis and his lungs and digestive system are gradually collapsing. Zak Crawford, who is just 14, shot an arrow nearly 500 metres – an incredible 150 metres further than the previous record. The teenager was competing in the senior under 35lb class using a recurve bow at the Northern Counties Flight Championships. He also broke world records in the junior recurve and junior compound categories at the competition at RAF Church Fenton in Yorkshire. Divers have discovered the WORLD’S LONGEST underwater chalk reef – off the coast of NORFOLK. 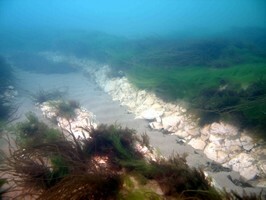 The incredible 20 MILE chalk reef, which is teaming with colourful fish, plants and wildlife, has remained hidden under the North Sea for 300 million years. 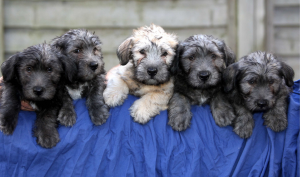 These five cute puppies have helped to make it a record year for Britain's most endangered breed of dog. Only 1,000 Glen of Imaal terriers are left in the world - less than the Giant Panda. A dog hit by an 80mph express train has miraculously recovered after three operations, £14,000 of vets’ bills and hundreds of SWIMMING lessons. Tyler, a five-year-old Gordon Setter, was left with a smashed pelvis, broken back leg and shattered toes after he amazingly survived when he was hit by the non-stop Stansted train. An overjoyed owner told today (Thurs) how her cat survived an incredible seven weeks without food or water trapped under the floorboards of the house next door. 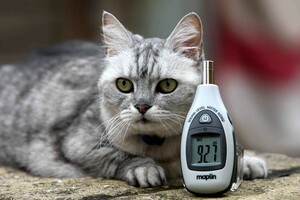 Miracle moggy Harry vanished from his home just before Christmas. A pensioner has unearthed one of the UK’s FIRST humanoid robots from a GARAGE where it has been stored for the last 45 YEARS. Former spy catcher and RAF officer Tony Sale, 79, built the incredible 6ft high robot, George, in 1950 for just £15 using scrap metal from a crashed Wellington bomber plane. At the time Tony was only 19 and his amazing man-sized model, which could walk and “talk” stunned the world as few people had ever seen a human-looking robot before. 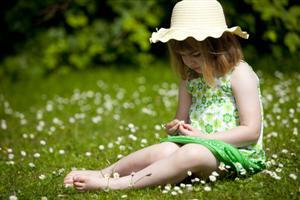 Children are making daisy chains by the dozen this summer after the mix of wet and warm weather produced plants with extra LONG stalks. An abundance of the most spectacular daisies in 15 YEARS have been popping up in parks and gardens across Britain. A DEAF dog has amazed trainers by beating of thousands of non-disabled dogs to pass the toughest obedience award in the UK – after learning sign language. 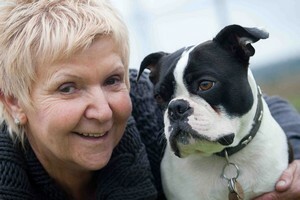 Top dog Zippy, a two-year-old black and white Boston Terrier, was born profoundly deaf and for the first months of his life he was trapped in a world of his own. 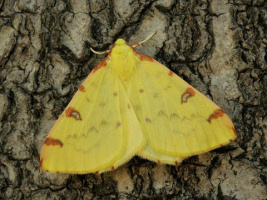 Families are being urged to help save Britain’s moths and bats from decline by spotting these nocturnal creatures in their back gardens. There are 2,500 different types of moth in this country but since the 1970s numbers have fallen by a third in the UK and nearly half in the South of England. 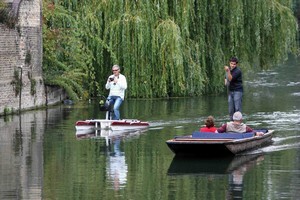 A Portuguese man wants to take on traditional punts in Cambridge with his new invention – a nautical BIKE. Historic Cambridge is known as a cycling city and now Victor David wants people to pedal on the WATER too. For the first time in 40 YEARS not a single daffodil has bloomed in time for Britain’s biggest Daffodil Festival. 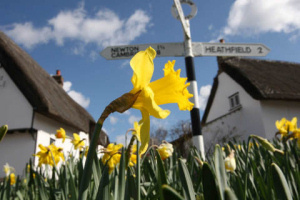 More than 10,000 people from all over the UK visit the tiny village of Thriplow in Hertfordshire each year to admire its hosts of golden daffodils. 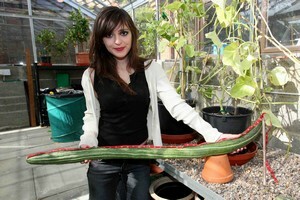 A grandmother in Britain believes she has grown the TWO longest cucumbers in the world. Clare Pearce, 78, had never grown cucumbers before but was stunned when one of her vegetables reached a record breaking 47 inches. 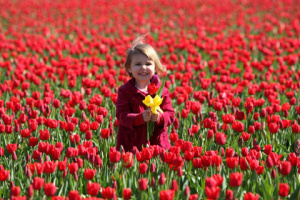 This may look like the heart of Holland but incredibly little two-year-old Isabella Ward is tiptoeing through the tulips in the middle of the English countryside. The Norfolk landscape is a kaleidoscope of colours as the tulips finally burst into life after a later than average Spring. Supermodel Lily Cole returned to Cambridge University for her graduation ceremony – a week after scoring a double first class degree. Lily paraded from King’s College to the historic Senate House to receive her degree certificate, with her proud mum there to watch. She wore her black graduation gown as she walked in procession with around 100 students from the college, where she has studied for the last three years. A girl who was the youngest baby ever to have a kidney transplant has since had a second one from her MUM and now amazingly is about to get a third from her DAD. 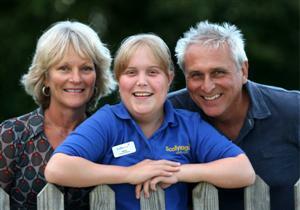 Keeley Beytell-Heron was just 12 days old when 20 years ago she became the youngest child in Britain to receive kidney dialysis. 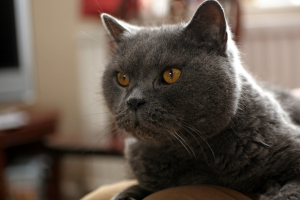 Pet cat Smokey is believed to have the LOUDEST PURR in the world - with piercing purrs as loud as a LAWNMOWER. Most cats purr at around 25 decibels but Smokey’s powerful purrs average an amazing 80 DECIBELS. An eight-year-old has stunned martial arts experts by becoming the youngest known GIRL in England to get a black belt in karate. Jasmine Hannah, who stands at only four foot two tall, has been awarded a black belt in sports karate with the highest grade of A+ just weeks after her eighth birthday. 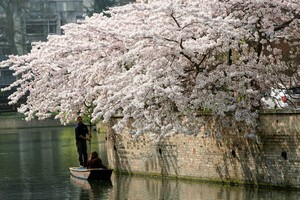 Cherry blossom is blooming FOUR WEEKS earlier in Britain this year thanks to the recent warm weather. The sunny spring days have helped the beautiful pink and white buds open more than a MONTH early in parts of the country. A baby who suffered complications following an intricate heart operation made a miraculous recovery after he was FROZEN for four days. Medics were astounded when 16-week-old Finley Burton pulled through after he was put on an external pacemaker and frozen to stop any shivering disturbing the device.